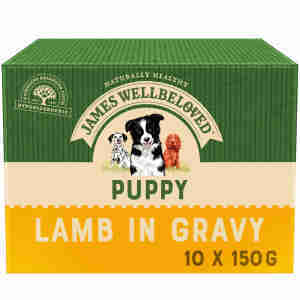 James Wellbeloved Puppy & Junior Pouches are designed with selected ingredients to help calm itchy or irritated skin of puppies and young dogs. These hypoallergenic pouches contain natural ingredients such as single source of meat protein and fiber from rice and vegetables which can reduce the risk of food intolerances. Enriched with a variety of minerals (alfalfa), seaweed and linseed, this recipe help maintain healthy digestion and soothe itchy coats. James Wellbeloved wet food has no artificial colours, flavours or preservatives and no beef, pork or wheat gluten, eggs or soya. Lamb meat, rice, peas, carrots, sunflower oil, sugar beet pulp, linseed oil, calcium carbonate, seaweed, alfalfa, potassium chloride, tomatoes. Contains: Lamb meat (min 26%), rice (min 4%), peas (min 4%), carrots (min 4%). Analytical constituents: Protein 6%, oil 4. 5%, ash 1. 2%, fibre 0. 5%, moisture 82%. Contains: Turkey meat (min 26%), rice (min 4%), peas (min 4%), carrots (min 4%). Analytical constituents: Protein 7%, oil 4. 5%, ash 1. 5%, fibre 0. 5%, moisture 81%. Brilliant food, my ESS loves it along with the James Wellbeloved dry food, He turned his nose up at other makes of dry food.